Entspannen Sie sich und campen Sie stilvoll mit einem Blick auf den See von 44 Meilen wunderschöner Küste. Unvergessliche Sonnenuntergänge & Sonnenaufgänge. Sandstrand mit Bootsrampe und wunderschönem Dock / Schwimmdock mit Gartenmöbeln zum Angeln. Vergessen Sie nicht, Ihre Angelruten mitzubringen! Wir haben Wels, Bass, Bluegill und Sunfish. Es gibt Fischfutter auf dem Deck. Genießen Sie die Aussicht auf das Deck des Wohnmobils, während Sie kochen. Wir erlauben Partys / Events mit detaillierten Informationen bei der Buchung. Verleih von Paddleboards und Kajaks für Gäste, die pro Tag 25 USD pro Person mieten können. Mieten Sie ein Skiboot mit einem erfahrenen Fahrer für 85 US-Dollar pro Stunde und mindestens zwei Stunden. Dazu gehören eine U-Bahn und / oder ein Wakeboard. Kleine Haustiere unter 25 £ (große Haustiere nach Genehmigung) sind gegen Gebühr willkommen - bitte bei der Buchung angeben. Very welcoming place to stay. Would stay there again. Very accommodating and enjoyable. Beautiful rv on Beautiful private property! We loved our stay here. Private fenced in spot on beautiful lake. Rv is set up with everything you need, just bring your own food and toiletries! Amazing outdoor space with spacious deck and combo gas/charcoal grill. Also sweet dock and beach to enjoy. Don was very responsive if you had a question. This worked out great for our family as we love camping vs hotels! The rental and property were just lovely! Great relaxing and quiet get away! The neighbors were friendly and very welcoming! We would stay again if we're in the area! When we drove up to the lot all we could say was “beautiful”. This is a little spot of heaven that offered many extras. The camper was extra clean and the owner was easily accessible if you had any questions. 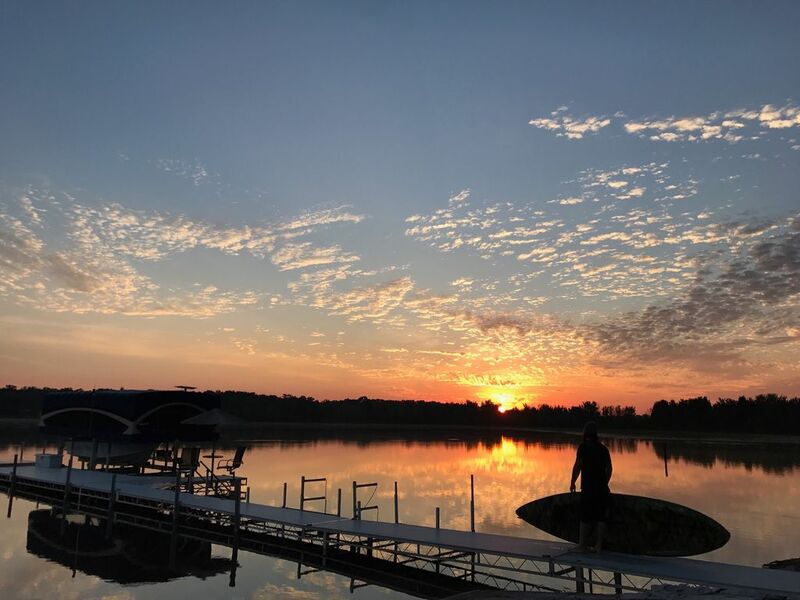 Our grandchildren enjoyed swimming, skiing/tubing, and fishing off of a great dock. The private boat landing was the best since we could launch our boat right where we were staying. The large multi-leveled dock provided even more square footage living/relaxing space. We made “S”mores in the fire pit at night and enjoyed the stars. This is a hidden gem that I highly recommend, as we were leaving the grandchildren all asked, “When are we coming back?” Family memories were definitely made and enjoyed by all. My family absolutely loved this property. It was the perfect place to have a weekend getaway. The scenery is beautiful and very peaceful. Everything you need is there and Donald is close and helpful with anything you need. We will definitely be vacationing here again!